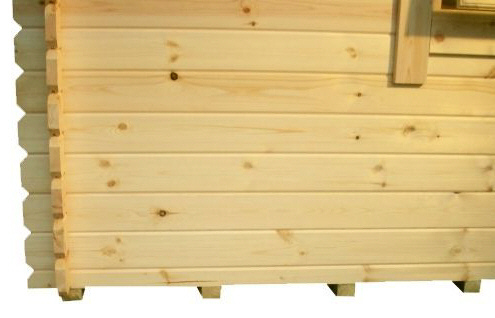 The imposing 44mm thick Dalton Log Cabin is the most prominent and popular log cabin within our entire range. The striking design shows the wide front elevation with an elegant 600mm roof overhang above the joiner made European style doors and windows. 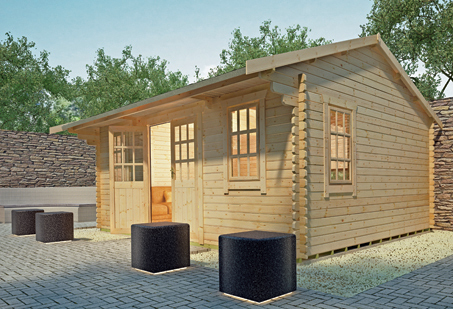 This Dalton Log Cabin is available in range of sizes and configurations – the doors and windows can be changed to an attractive and unique Georgian style if preferred with double glazing and toughened glass options also available as an optional extra. The multitude of glazing in this building allows for light to enter the spacious interior, there is even a shelf above the double doors to allow for extra storage. The extra thick 44mm interlocking logs are made from high quality European softwood and not cheaper grown Baltic timber meaning the logs will look nicer and last much longer. The 19mm thick floor with heavy duty tanalised pressure treated pre-attached floor joists is modular and so assembly is even easier. The 19mm thick roof will protect the building from the elements without even a need for added insulation. All doors and windows are silicone beaded internally and externally as well as being fully draft sealed providing further reasons why this is ideal to be your new office, garden bedroom, or outdoor space. So take advantage of this fantastic cabin on offer now and become the envy of all of your neighbours. DOORS AND WINDOWS - This log cabin features oversized extra large doors and windows, which are professionally joiner made, draft sealed and silicone beaded internally and externally. 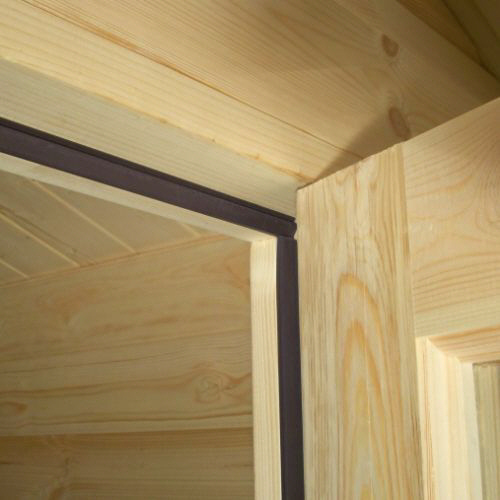 Cheap competitor imitation log cabins generally come with smaller ill-fitting doors and windows which are hung externally using low quality pin hinges - these are more prone to twisting and warping. LOG CABIN HEIGHT - This log cabin is extremely high at both the eaves and the ridge providing a maximum useable space within a given footprint base size. 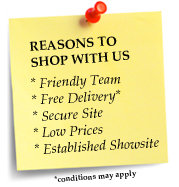 We can offer to reduce this for no extra charge. 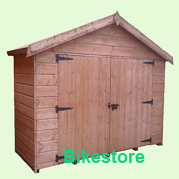 Many cheap competitor imitation log cabins are already very low and not flexible enough to offer variance in heights. FLOOR QUALITY AND FIT - This log cabin features an easy-fit modular floor for a fast and easy assembly with weatherproof pressure treated floor bearers. Cheap competitor imitation log cabins generally supply log cabins with individual do it yourself’ floorboards which can be problematic and time consuming. They often provide untreated floor joists which offers no protection against damp penetration at floor level or worse still may come with no floor joists at all. LOCKING SYSTEM - This log cabin features decorative brass handles with a high quality three lever lock - the sort of locks you would find installed on the door of a house or secure office. The majority of competitor imitation log cabins use cheap and less secure European cylinder locks putting your belongings at risk. ROOF MATERIAL - This log cabins features heavy duty green mineral roofing felt as standard, with the easy option to upgrade to premium quality roof shingles, available in red, green, brown, or black. Cheap competitor imitation log cabins sometimes come with no roof covering, leaving the log cabin completely open to the elements.